I’m an expatriate Californian but I have never forgotten that special light that turns the edges of trees golden and the hills blue-purple. Could it be smog? Regardless, it has drawn countless painters to California to attempt to capture it by painting en plein air. My appreciation for the early California impressionist painters was sparked while working as a volunteer in the Art Department at the Oakland Museum of California many, many years ago. As a matter of fact, it was so long ago (circa 1969) that I assisted in the move from the Oakland Municipal Auditorium to the new building. In the process, I became acquainted with some of the treasures in the collections, many that are not exhibited. 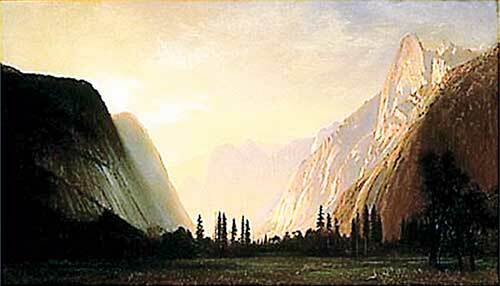 Beginning before the turn of the century, Albert Bierstadt painted expansive canvases to try to capture the grandeur of the Yosemite valley and surrounding granite cliffs. Though painstakingly detailed (though not exactly realistic), his observation and dramatic use of light were new. As a contemporary of the impressionist movement, he was probably not influenced directly, however he did exaggerate the subject and colors to make his paintings more awe-inspiring. Viewed in a large gallery his paintings fill the entire space. Those with ethereal light sifting through mist seem three-dimensional. Albert Bierstadt (1830-1902, American), Yosemite Valley, oil on canvas. Another painter whose works are extensively represented in the collection is John Marshall Gamble. Once again, it is the quality of light, the clouds and fog that are at once evocative of the California coastal hills. 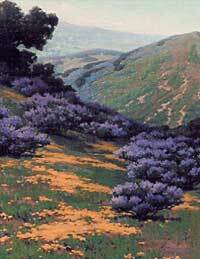 Obviously influenced by the impressionists, he was especially drawn to the spring display of wildflowers with their complimentary colors: blue lupines against orange California poppies. He painted dozens of such canvases. When asked about his passion for wildflowers, he explained, “I never painted them as flowers at all. I didn’t even think of them as flowers while I was painting. They were just color patches to me, I simply liked the way they designed themselves across the field.” He clearly lived for spring when he could haul his easel, paints, brushes and canvases over hills flowing with wildflowers to sit among them and attempt to capture the vistas that were ever-changing with the passing of sun and fog. Gamble’s landscapes were not the only ones that made use of that liquid light quality. Between the museum’s library and Oakland and Berkeley public libraries, I soon discovered the same use of light in the paintings of his contemporary Californians: Maurice Braun, William Wendt, Angel Espoy and the landscapes of Franz Bischoff and Marion Wachtel. Or maybe it was that the scenes they painted were so familiar. I eagerly looked for others who came to California during the early 1900′s to take advantage of the agreeable climate and the pervasive sunlight. The Mathews’, Arthur and Lucia, are my favorite artists of the Oakland Museum of California collection. They too attempted to capture the light and the impression of a moment in time in their paintings, but I was initially drawn to their woodcraft. Some of the furniture pieces and picture frames are exquisitely carved and painted with California wildflowers, small birds and animals, or figures. They worked at the zenith of the California Craftsman style. Lucia Mathews (1870-1955, American) Pine Trees #3, oil on canvas. However, their landscape paintings in the museum’s collection are highly representational, using the impressionist coloring techniques and large brushstrokes. 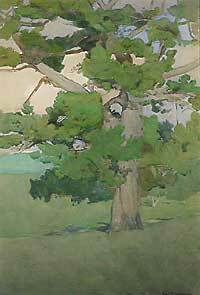 Among my favorites is a painting by Lucia Mathews that captures a stately coastal pine, delicately outlined and cropped, bringing to mind a Japanese woodblock print, a style that was more popular in Europe than America at that time. Neither landscape or impressionist, this representative of Arthur Mathews’ Joy and Youth series (one example, below) is nothing but joy and recalls that time in my life when I was associated with the museum and the delight in the discovery of art that is so vividly represents the California light. View a gallery of California impressionist paintings. 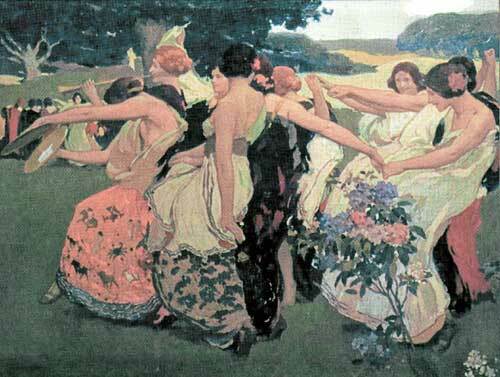 Arthur Mathews (1860-1945, American), Youth, oil on canvas.